Amaranthus cannabinus.© Gary P. Fleming.Atlas of the Virginia Flora.www.vaplantatlas.org.2014. Virginia Botanical Associates, Black (Accessed 9/2015). 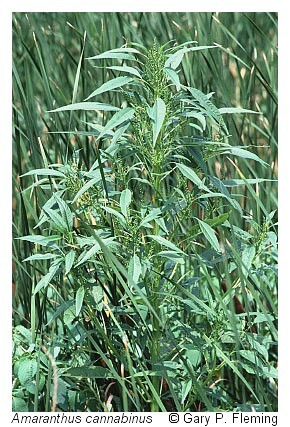 Amaranthus cannabinus is an annual C4 herb (Costea and Tardif 2003), 1-2.5 m tall, erect, stout. Leaves alternate, stalks to 5 cm, blade to 15 cm long, 4 cm wide, narrowly lance-shaped, upper leaves smaller, tapered to a blunt tip. Flowers green, inconspicuous, no petals, bracts at base 0.2 cm, scarcely bristly; sexes on different plants (dioecious); male flowers with 5 sepals to 0.3 cm, unequal, female flowers without sepals, style 3-5-branched, feathery-hairy, wind-pollinated (Quinn et al. 2000); inflorescence of large, branched clusters at top of plant, with numerous spikes female plants with leafy spikes, male plants with leafless spikes; blooming and fruiting July-Oct.
Fruit fleshy, 0.3-0.4 cm, 3-5 ribbed, often finely wrinkled; seed to 0.3 cm very flat, dark brown. Habitat: High salt marshes and brackish or freshwater areas.